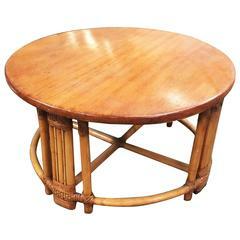 Originally beautifully Thonet table attribute to Otto Wagner designer complete restored and shellac politured. Beautiful rare Thonet bench completely restored. 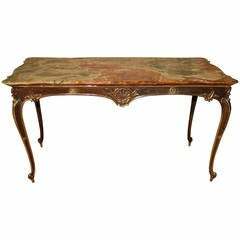 Beautiful bronze French coffee table covered with an onyx stone. The work bronze is finely carved and the onyx stone wear bright colors. 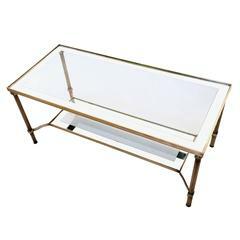 This beautiful table is made in brass and features glass tops with a silvered frame. It is in good original condition. 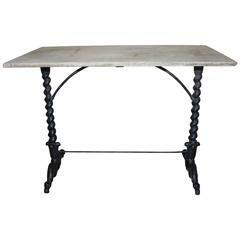 This beautiful garden or bistro table is in cast iron and wear a top made of stone, Louis XIV style. Beautiful French coffee table attributed to Jean Royère. Black wrought iron frame with a brass ball on the end of each leg. Glossy black glass top. Keywords: Adnet.